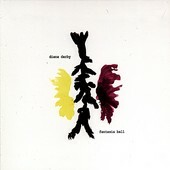 Recorded at home on a 4-track cassette machine, Diana Darby's Fantasia Ball flourishes, her weepy, hushed voice and the muffled acoustic guitar conveying intimacy and urgency. Dark and moody, the songs sound right at home when you're alone, comforting you as you both rejoice at each other's company. Here is a singer-songwriter who can write touching, sparse songs that need little accompaniment, filled only by the dirty sound of the acoustic guitar and Darby's contempt-filled voice. This is female anti-folk with a heart beating on her sleeve. I'll give it a B.